All of Kentucky's counties have been tested to varying depths for oil and gas resources. Production was reported from 65 counties. In general, oil production dominates in the Western coal field and South Central areas of Kentucky. Kentucky has an estimated 18,000 producing oil wells and 13,000 producing gas wells. From recent studies done by the U.S. Geological Survey, it has been established that the Appalachian mountain range possesses huge reserves of untapped oil and gas. Thus, because of these reasons that are backed by the geological surveys done in this region, points to the fact that this region is floating on oil and gas reserves. This could be worth a fortune for the people who drill in this region of Kentucky. Petroleum is produced at various depths from limestone, sandstone and shale of Cambrian thru Pennsylvanian age. In some parts of South Central Kentucky, oil is still produced from wells less than 100 feet deep. The overall total depth of oil and gas wells drilled in Kentucky is less than 1500 feet. 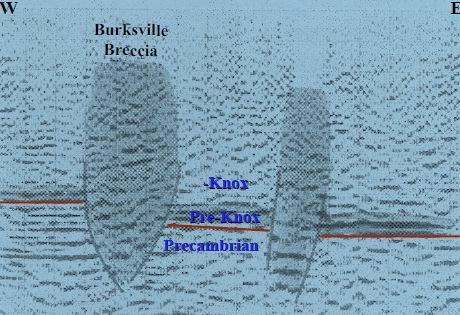 Actual seismic imaging of a hydrothermal vent (chimney) in Burkesville area, Cumberland County, Kentucky. A chimney will channel oil from huge deep oil reserves to near surface formations.